Make these super easy and authentic udakiche modaks to please not just Lord Ganesha but everyone at home 🙂 This is a very simple recipe and believe me when I say that if I can make it, you can make it too! I’ve been staying away from making modaks for last 4 years but finally after missing them for so long, this year during Ganesh Chaturthi, it was finally the time when I made some of these delicious little sweet dumplings. It is the season for celebrating the most loveable Hindu God — little Ganesha. And while he loves all kinds of sweets, his favorite is the steamed modak called Ukadiche modak in Marathi and Hindi. In Sanskrit, Lord Ganesha is called modakapriya – one who likes modak! Ukadiche modaks are steamed flour dumpling filled with a sweet coconut and jaggery filling. While there are also fried modak varieties, and you can find many fusion fillings as well, the most authentic modak is steamed and filled with this coconut and jaggery stuffing. Ukad literally means the covering, it is a very thin dough covering made either of rice flour or wheat flour. In this recipe, I have used wheat flour as it is easier to shape. If you are in India (especially in Mumbai), you can’t miss the chants of “Ganapati Bappa Morya” during this week. Ganesh Chaturthi was on September 13th and from September 15th, visarjan started with the biggest one being tomorrow. Over the years, awareness about eco-friendly Ganesha has increased and more and more people are going for mud Ganesha statues that do not add to the pollution in the rivers and oceans. Below is this year’s Ganesha idol made at the Gandhi Ashram where I regularly volunteer. When we lived in Bombay, the 10 days of Ganesh Chaturthi used to be fun days with many fairs around the city. Every day, for the 10 days, we were invited at one friend’s home or another who had brought the little Ganesha home and were celebrating either the bringing of the statue or the immersion of it. So we had different varieties of modaks every day and so I never really tried making one. I used to think it will be super complicated, especially to make the modak shape. This is a very easy recipe for the steamed modaks with just 6 ingredients. 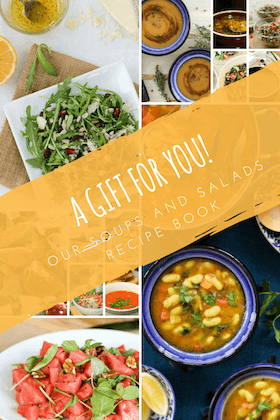 No fancy variations or fusion with another recipe. 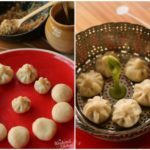 While the Ganesha festival is over, I’m planning to make these easy steamed sweet dumplings for my Diwali dinner menu as well. They can easily be prepared a day in advance and stored in the refrigerator in an airtight box. 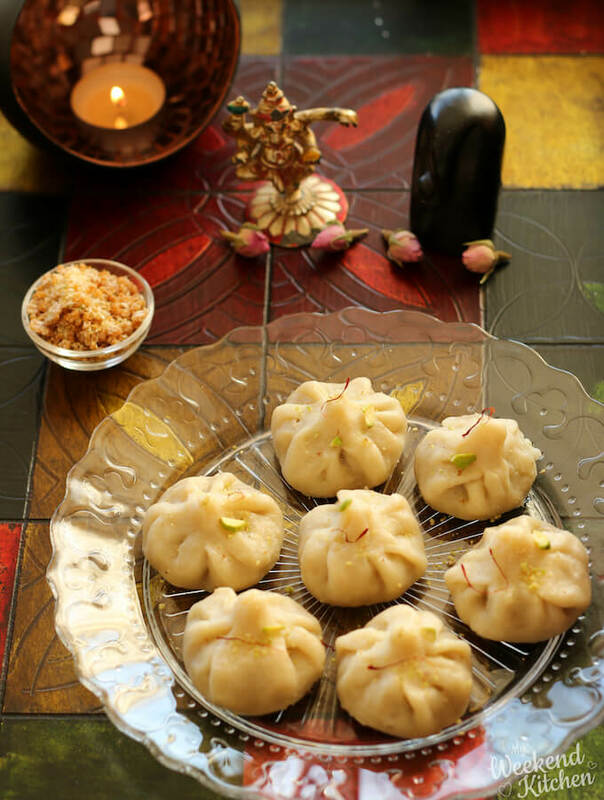 A simple recipe for Ganesha’s favorite sweet — Ukadiche Modak — steamed dumplings with a sweet coconut and jaggery center. A traditional Maharashtrian sweet, modaks are now prepared across India as the whole country celebrates Ganesh Chaturthi and Visarjan. Add ½ cups of water with a pinch of salt and 1 tsp of ghee in a stock pot. Bring to a boil on medium heat. Once the water comes to a boil, switch off the heat and add ½ cup all-purpose flour to the pot. Mix well. It will be a very lumpy, sticky mass. Cover and leave it aside to cool down while you prepare the stuffing. To make the filling, heat 2 tsp ghee in another pot. Once the ghee melts, add grated coconut and jaggery. Mix well until the two are well combined. It takes some time for the two to combine properly. Around 5 mins. Next mix in the dry fruits powder. Remove from heat and let cool, while you knead the dough for the modak covering or ukad. Remove the flour from the pot into a flat plate and lightly knead it with a little more water and ghee into a smooth dough. Just like parathas or any other bread, the trick here is to knead the dough really well otherwise the modak might break while rolling. Prepare a plate by greasing it with a little oil or ghee. Divide the dough into 10-12 pieces and shape into balls. For each dough ball, make a well in the center with your right thumb and then roll it into a thin cup using your fingers. It will be about 3-4” in diameter. 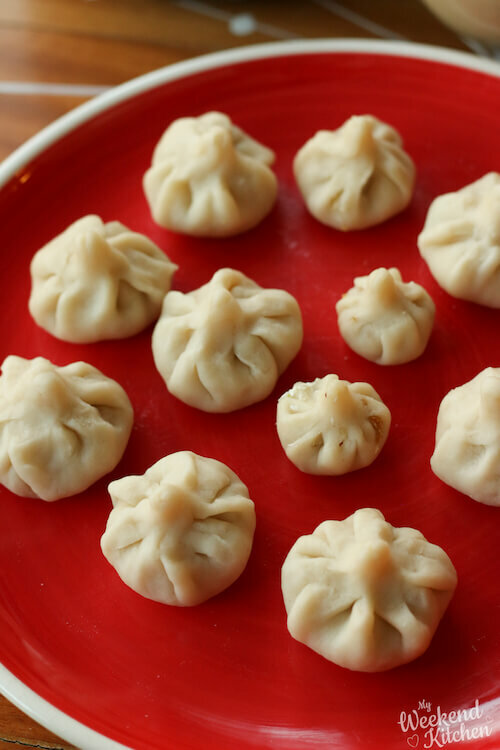 While you prepare the modaks, add water to your steamer and keep it on high heat for boiling. Place the prepared modaks on the steamer plate and steam for about 15 mins. To check if they are done or not, just touch the modaks, if they don’t stick to your hands, they are done. Be careful as you open the steamer to check and to remove, as there will be a sudden gust of steam as you open the steamer and the modaks will be very hot inside the steamer. Sprinkle with some more dry fruits mixture and serve as an offering to Lord Ganesha and your loved ones! I have used desiccated coconut in this recipe as fresh coconut was not available in Bucharest but if you have access, it is best to use freshly grated coconut for the filling. Thank you so much for your encouragement! I am sure they are still a bit away from the true shape! I am so glad the recipe inspired you to try it 🙂 Would love to know how it went! Such a traditional Maharashtrian sweet must to be prepared for festival !!! First of all I just loved your cute Gannu Bappa , and nothing can be better than these traditional modaks to offer him , lovely share. I found them in a village where an artist was carving them out of small stones. We ended up talking for a long time on the roadside and ultimately he just gifted me that little black idol :-). Wish i get a box of ukadiche modak from you, how cute and beautiful those modak looks.. Love this authentic modak anytime of the day. Thank you so much, Priya. Well if you live anywhere close to Udaipur, I would love to send them to you next year probably! 🙂 his was my first time and I was anxious of how they will turn out that I only made a small batch. Super delicious modaks!! Normally we use rice flour, your maida ones look so good…must try it! Ganapati looks so cute and divine! The ukadiche modak platter looks divine ! We use rice flour to make the outer covering for the modak which has to be worked well to form pleates. Lovely share ! Exactly the reason why I went with all-purpose flour for the first time. I wasn’t too sure of working the rice flour into pleats as rice flour dough breaks easily. But would love to have tips on how to do it with rice flour for my next time! 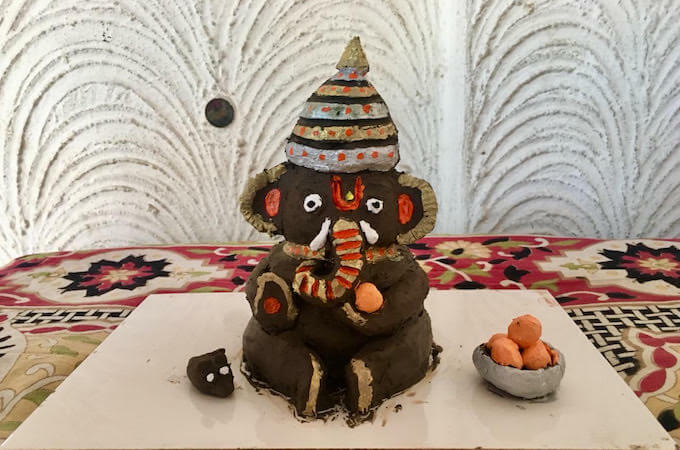 What a beautiful and informative post on Ganesh Chaturthi and modak, Your eco-friendly Ganudada looks so cute. I have never tried making traditional modak at home as I have no faith in me to make them as good as yours 🙂 Lovely share. I make the same way as you prepared, only the difference is I use rice flour instead of maida. I love the way you explained. Ganpati Bappa Moriya. These ukadiche modak looking perfectly cooked and stuffed.I have not yet tried these. This year we too are out of India. I had been welcoming Ganesha from last few years for 5 days. This year did for 3 days. Though I find a bit difficult but really enjoyed 3 days. I love this festival. Great post Ashima! Your Ganesha Idol and Modak is very cute and Beautiful. My mom always makes this traditional Modak for Ganesh Chaturthi, after quite some years, I joined with her this year and I had the opportunity to make this Modak with her. It may not be perfect as yours. But I enjoyed my moment. By the way, my modaks are not perfect 🙂 I have seen such beautiful ones at aunt’s and friend’s homes in Mumbai… I am just aspiring to be like all those moms! I loved reading your post and the way you have clearly explained the process of making modak. Always love to celebrate ganesh chaturthi, unfortunately now being outside India sometimes seems not possible to enjoy as much as I enjoy in India. Overall a great share Ashima. 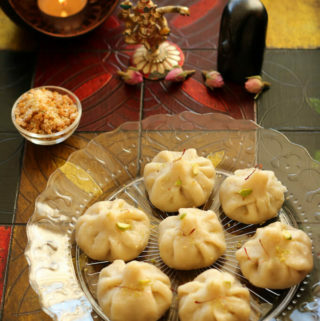 Love these traditional modak and you have made them perfectly. Lovely share for the festival, though I am late here. 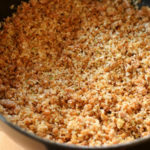 We use red rice flour with the same stuffing. Perfect share for Ganesh Pooja.Awesome share . I am glad you found it helpful! 🙂 I hope you make some soon! Yes, they are and thank you so much for your kind words. I am sure they aren’t perfect and I need more practice but your words really encourage me! Thank you so much. Beautifully explained the recipe. Thanks for such a traditional recipe. Looks amazing. Loved the idol of little Ganesha. Love the post.